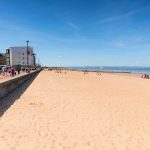 We are perfectly located within Edinburgh city to see the sights of the city centre, but being on the edge of the East Lothian Coast is an ideal base to see other parts of Scotland too! Listed below are a few potential days out which are on our door step. 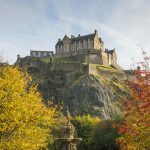 However you can easily spend a day in Glasgow, Stirling or St Andrews using Straven as your base by either car or public transport or by tour bus. Make the most of your holiday! Dirleton is a pretty village on the coast in East Lothian between Gullane and North Berwick. See the Castle which has a Gold award with Green Tourism for its Eco standards. This is run by Historic Scotland. It costs £6 entry and you can see the 400 hundred year old picturesque ruins and gardens. Spend the afternoon at Yellowcraig Beach in Dirleton. This fabulous beach has great views to the Island of Fidra, which is uninhabited and is now an RSPB bird sanctuary. You can see the lighthouse (automated since 1970). 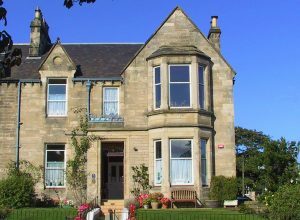 There are 2 Inns in Dirleton for food, or alternatively stop for lunch at Archerfield Estate (only 5 minutes in the car or a nice ½ hour walk). Archerfield has a walled garden and ‘fairy’ walk with the option to hire bikes to explore the Estate. Tempting gift and farm shop. This is on the lovely coastal walk of the John Muir Way. If you have time and would like to see some more of the coast why not stop at Gullane beach too? A scenic long sandy beach in the beautiful golfing village of Gullane. Tantallon is a magnificent ruined castle sitting dramatically on a cliff side in East Lothian. The ruins are maintained by Historic Scotland and have the Silver award with Green Tourism. There is a lot to explore in the ruins including the dungeons. Climb the stairways to the upper walls and get fantastic views to the Bass Rock with the oldest gannet colony. It costs £6 for day entry. When there you can see fantastic beaches along the coast. 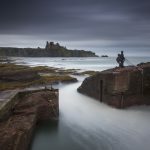 Our favourite bay is Seacliff about 1 km further East from Tantallon. It is a sheltered beach with fantastic views of Tantallon Castle and the Bass Rock. There is an amazing wee harbour which was created in 1890 and is the smallest harbour in the UK (rarely used now). You can take a beautiful coastal walk from North Berwick to Tantallon Castle if the weather is fine. 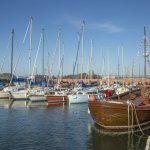 North Berwick is a picturesque seaside town with a nice beach and seafront. There are cafes, restaurants and shops. In the morning see the local seabird centre (£8.95 entry fee) where you can control interactive live cameras on the local islands to see the birds in their natural habitat. The top 10 wildlife in the area : gannets, puffins, guillemots, razorbills, kittiwakes, eider ducks, peregrine falcons, seals, dolphins and whales. Stop for sandwiches and cake at one of the cafes – the Café at Merryhatton is probably the best for cake!! After lunch take a walk up Berwick Law to see the beautiful views. This volcanic plug rises 187 metres and has a fibreglass whalebone at the top. 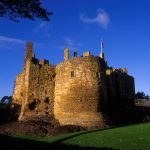 Take a day trip to South Queensferry. 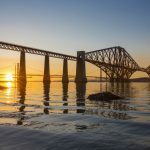 See the beautiful vistas of the bridges over to Fife. You get the picture postcard view from the shoreline of South Queensferry. It is also worth the walk cross the 2.5 km Forth Rd Bridge as the views are great. Enjoy the craft shops back in the shelter of South Queensferry and have a bite of lunch at the Little Bakery café. Take a boat trip to see Inchcolm Abbey the best-preserved Abbey in Scotland. The boat trips are great for wildlife including puffins and basking seals.